British artist Eelus brings his latest edition Hold On To What You Got a new series of screen prints and hand-painted multiples created just for his debut RUN. This playful edition pulls it’s message in directly as Eelus tells us below, fitting seamlessly into his expansive catalog of simplicity and bold colors. Alongside a series of extremely limited uniquely hand-painted editions, the standard edition will be available for only 48 hours, so be sure to grab yours before they are gone. Read on as Eelus gives us the lowdown on his debut RUN, his earliest influences and much more . . .
1xRUN: Tell us a little bit about these print editions, there anything immediate you would like us to highlight about this imagery? Eelus: It’s a very simple image that needs little explanation really. 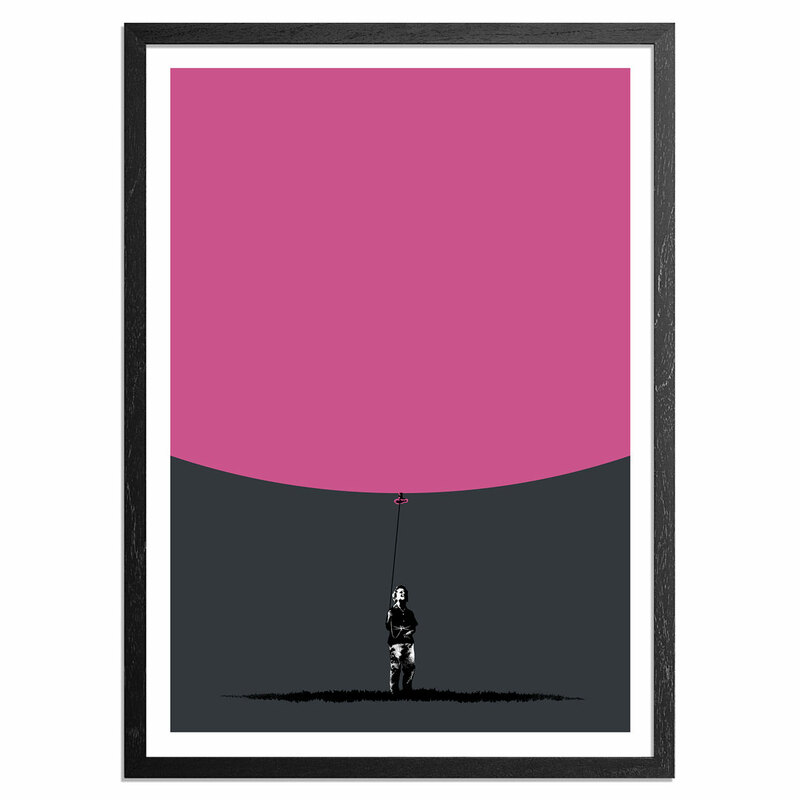 It depicts a young boy tethered to an oversized balloon, but he stands firm and his feet are rooted to the ground. I guess its message is to keep your dreams big, play big, love big, but stay grounded. 1x: Was this imagery part of a recent theme, series or show that you had? When were these pieces created and what materials did you use? How long did this piece take from start to finish? Eelus: No. The artwork for the print is a mixture of digital art and scanned spray painted layers. This piece was created about 3 weeks ago over the course of around a week alongside other projects. Eelus: I have a huge collection of reference photos, mainly vintage family photos that I find fascinating. Very often I find an image that instantly just sparks an idea, it’s very similar to collage, I see one thing, take it, and add to it, creating something new. Eelus: I think this piece fits comfortably among a lot of my previous works in its simplicity, bold colours and playfulness. It’s part of a larger body of work that I’ve dipped in and out of for years. Eelus: Because I have a family, a dog and two cats and they all need to eat. Plus the print is a smile for the mind, it’s a simple image with a simple positive message. Sometimes that’s all you need to bring a bit of happiness into your day. 1x: When did you first start making art? Eelus: I’ve enjoyed art and drawing since I was very young. Making art and telling stories are the only things I’ve ever been good at, or interested in. But I started stencilling after moving to London around 2001. 1x: What was your first piece? Eelus: I started stenciling weird little characters from my sketchbook to start with, then I created an image of a girl taking a Star Wars At-At for a walk and started to paint that everywhere. It went on to become my first screen print released through Pictures On Walls, and that was the start of my art career. I’ve now been making art full time for around 10 years. 1x: What artists inspired you early on? Eelus: H.R.Giger, Boris Vallejo, Frank Frazetta when I was growing up, they got me hooked. Then after moving to London and discovering the street art scene I was inspired by people like Banksy, D*Face, Mysterious Al, Logan Hicks, Shepard Fairey, Jamie Hewlett and Paul Insect. 1x: What artists inspire you now? Eelus: Mainly older artists outside of the street art scene. Matisse, Aubrey Beardsley, Arnold Böcklin, David Hockney, Peter Doig, Utagawa Hiroshige. Too many to list really, but artists like Banksy and Logan and the others who sparked the fire for me will always be a source of inspiration in many ways. Eelus: It depends what stage of the process I’m at. If I’m generating ideas, sketching, dreaming, then I listen to mainly film scores, ambient music, anything atmospheric with no lyrics. When I’m cutting stencils or doing something that doesn’t need the same level of focus then I’ll listen to audiobooks and podcasts. When I’m actually painting, again, I enjoy audiobooks or any kind of music, from metal to electronica to jazz. 1x: If you could collaborate with any living artist who would it be and why? Any deceased artist? Eelus: Something completely different would be exciting, like a music video for someone like Bjork or Aphex Twin. [For the latter] Picasso. To soak up and steal as much from him as possible. Or David Bowie, on absolutely anything, I’d be happy to just do to his laundry. Eelus: I don’t actually own that much original art, but I do have a few prints that I bought back in the P.O.W days, Banksy’s, Anthony Micallef, Jamie Helwett, Eine etc. I think the first piece of original art I bought was a Mike Egan painting, I’m looking at it right now, it’s of a green devil like character surrounded by crucifixes. I still love it. Eelus: It’s a tiny painting by my artist and illustrator friend Will McLean from Australia. I bought it a couple of weeks ago and it was actually the first painting he’s ever sold, which I didn’t know at the time. It’s an expressionist painting of some trees. Eelus: I’m exhibiting a new painting at the Affordable Art Fair New York with Olivia Connelly in March and I’m in a small stencil group show at Hashimoto Contemporary in New York that opens April 4th.